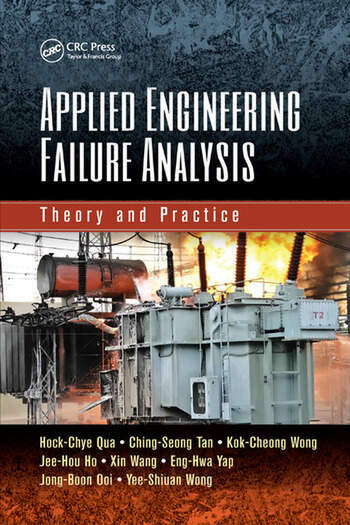 Applied Engineering Failure Analysis: Theory and Practice provides a point of reference for engineering failure analysis (EFA) cases, presenting a compilation of case studies covering a 35-year period, from the 1970s to 2012. This period spans the era from the time when slide rules were used routinely for engineering calculations, and when hard-copy photographs taken by film cameras were pasted onto typewritten sheets to make reports, to the present time when all these functions have become much less onerous through computer assistance. The cases are drawn from such diverse fields as mechanical engineering, metallurgy, mining, civil/structural engineering, electrical power systems, and radiation damage; the last two topics are quite scarce in current publications. It includes theoretical content that deals with useful topics in basic theory, material properties, failure mechanisms, EFA methodology, and applications. It provides high-quality illustrations throughout, which greatly helps to promote the understanding of the failure characteristics described. This book offers an integrated approach that serves as a useful first reference in the above topics, for undergraduate and postgraduate students, as well as for practicing engineers. The book provides a hands-on approach to EFA, which helps the user to develop an understanding of potential failure situations, to explore the consequences, and to better understand how to solve similar problems; it also helps users to develop their own techniques for most other engineering failure problems. The authors include a section on technical report writing, which will assist failure investigators in getting their findings across. They also present simple engineering calculations that may serve as illustrative examples, and typical problems and solutions are included at the end of each chapter. Hock-Chye Qua graduated with a B.E. (Mech) and a M.Eng.Sc. from the Engineering Faculty of the University of Malaya, where he later served as a staff member until retirement as an associate professor in 1999. He was one of the pioneer failure investigators in Malaysia and has been active in failure / forensic investigations for more than 40 years on a large variety of cases within Asia, spanning the mechanical, metallurgical, structural steel, and electrical disciplines. He is a Professional Engineer and a Fellow of the Institution of Engineers Malaysia. Ching-Seong Tan is an associate professor of Faculty of Engineering, Multimedia University, Malaysia. He currently serves as Division 8 head of CIE Malaysia, under TEEAM (The Electrical and Electronics Association of Malaysia). Dr C. S. Tan received the J. W. Fulbright award in 2012/2013. He is the speaker for the Compact Fluorescent Lamps (CFL) & Fluorescent Lamps (FL) Recycling Program sponsored by GEF-UNDP grant. He is also the recipient of the visiting scholar award from Centre of Interdisciplinary Mathematics and Statistics (CIMS), Colorado State University (CSU) in 2014. Kok-Cheong Wong received his B.Eng (Hons) from University Malaya in mechanical engineering, M.Eng from Kyushu Institute of Technology Japan and PhD from The University of Nottingham Malaysia Campus. He has several years of working experience in a multinational company. He is currently an associate professor at the University of Nottingham Malaysia Campus, delivering undergraduate courses in introduction to aersopace technology, aerodynamics, finite element analysis, design, and manufacturing. He looks into research areas related to fluid flow and heat transfer, particularly in the areas of jet impingement and microfluidic cooling, convection in porous media, and fluid structure interaction. Jee-Hou Ho is an associate professor at the University of Nottingham, Malaysia Campus, delivering undergraduate courses in machine dynamics, robotics, and automation technology. His research interests are in the areas of vibration energy harvesting, bio-mechatronics, and robotics. Jee-Hou received his B.Eng (Hons) and M.Eng in mechanical and production engineering from Nanyang Technological University (NTU), Singapore and PhD from The University of Nottingham Malaysia Campus. Xin Wang is a senior lecturer at the School of Engineering, Monash University Malaysia, where she is delivering undergraduate courses in non-destructive testing and inspection. Her research interests include non-destructive evaluation, optical inspection, and finite element analysis. Eng-Hwa Yap is a senior lecturer at the University College London’s School of Energy and Resources, Australia (UCL Australia) where he leads courses in water resources management and energy efficiency and conservation. Eng-Hwa’s research work is concentrated largely on sustainable system dynamics modelling using renewable energy technologies. He looks into the dynamics of such technologies’ integration within the community with a focus on emerging economies. Eng-Hwa holds a PhD in marine engineering from University College London and an undergraduate degree in marine technology from Plymouth University. Jong-Boon Ooi received his B.Eng (Hons) and M.Eng.Sc in mechanical engineering from Universiti Tunku Abdul Rahman, Malaysia. He was a lecturer at the Faculty of Engineering and Built Environment, Tunku Abdul Rahman University College from 2011 to 2014. He is currently pursuing his PhD in Monash University Malaysia. His current research interests are in fuel additives, combustion of fuels, and internal combustion engines. Yee-Shiuan Wong is a B.Eng (Hons.) materials & manufacturing engineering graduate from Universiti Tunku Abdul Rahman, Malaysia. He was trained by Ir.Qua and Ching-Seong Tan. He is now working as an engineer in a MNC specializing in advanced materials. "…provides an introduction to the process of failure analysis as applied in forensic examinations carried out following material and/or structural failures. It is particularly useful in that it presents numerous case studies from a wide range of engineering scenarios."